A tamper-proof vibration indicator paste that can improve safety and reduce inspection time across a number of industries is now available locally from Bearings International (BI). Applications for DYKEM Cross-Check Torque Seal range from haul trucks to head gaskets in vehicles, gearboxes, and even conveyor belts, BI product manager Richard Lundgren explains that when a piece of equipment vibrates, whether it be a car, aeroplane, crane, or water supply pump, there is always the chance that nuts and bolts may loosen. It is essential to be on the lookout for this when servicing equipment or carrying out routine maintenance, in order to prioritise safety and reduce downtime. 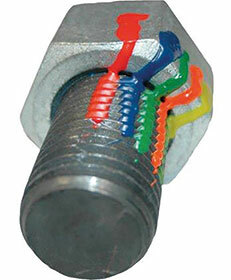 To use the product, the artisan simply draws a line of the paste from the bolt head and along the threads of the screw, once ideal torque has been achieved. At the next inspection, the artisan checks to see if the brightly-coloured mark is still in alignment. If not, action can be taken there and then on that specific bolt, instead of having to retighten all of the bolts, thereby speeding up the process and reducing the possibility of any loose bolts being missed. With its excellent adhesion to all types of materials, including steel, the indicator paste comes in a range of eight colours for high visibility, and is also fluorescent under UV lighting. Lundgren stresses that the safety aspect of this product cannot be overstated, especially when one considers the potential danger of a bolt coming off a long conveyor belt in a factory where people are working in close proximity. Preventing potential dangers like this by using the vibration-warning indicator paste means safety checks can be carried out more easily, as they now take just a few minutes. The indicator paste is supplied in a tube, and comprises a gel-like substance. This is dry to the touch in one to two hours, and fully cured in 24 hours. It also has a two-year shelf life, meaning clients can be sure of the quality of their stock. The product is GHS compliant and meets the Globally Harmonised System for classification and labelling of chemicals, the guideline for ensuring the safe production, transport, handling, use and disposal of hazardous materials. Typical applications are found in the manufacturing, agricultural, mining and power generation sectors.